The Soviet-German Non-Aggression Pact of World War II is an important event in the outbreak of fighting in the war. 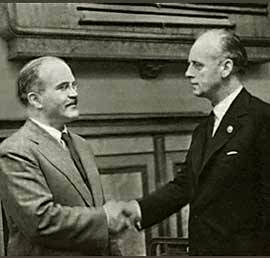 It was signed in Moscow on August 23rd, 1939 be the foreign ministers of both countries: Vyacheslav Molotov for the Sovit Union and Joachim von Ribbentrop​ for Nazi Germany. At its heart, the pact called for neither country to attack or fight against the other. As well, it set out expectations that neither country would ally against the other and help other countries wage war against the other. Finally, it divided parts of eastern and northern Europe into spheres of influence for both Nazi Germany and the Soviet Union. The pact is significant because it was signed just over a week before the start of World War II. Germany invaded Poland on September 1st 1939 and began to divide the country in half. The other half of Poland would later be taken by the Soviet Union. The September 1st invasion by Nazi Germany is viewed today as the starting point of World War II because both Britain and France declared war on Germany soon after. The benefit of the non-aggression pact to Germany is obvious: it allowed Adolf Hitler to wage war in Europe without risking a two-front war, as the Soviet Union had traditionally aligned itself with Britain and France. Hitler wanted to avoid the potential of a two-front war, which Germany had to face in World War I, and hoped that a non-aggression pact would keep the Soviet Union out of the conflict. For its part, the Soviet Union led by Joseph Stalin, agreed to the terms of the pact because it allowed the Soviet Union to expand its sphere of influence in Europe and to avoid being pulled into a major conflict against the powerful armies of Nazi Germany.